Comic books, as we know it, are getting on with the digital age. 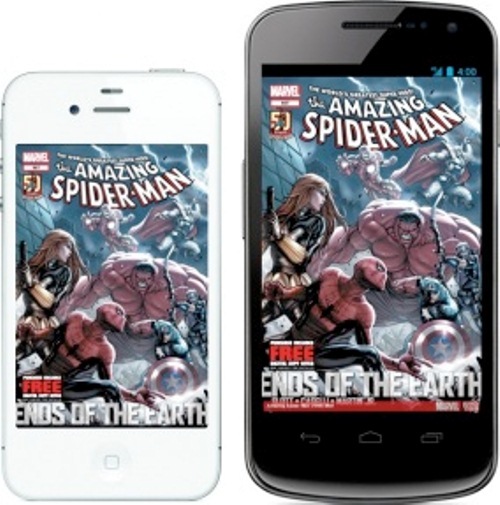 Every printed comic book now has its digital counterpart you can view on your smartphone. What can you say of you can get two for the price of one? Starting in June, Marvel comics that cost $3.99 or higher will come with a code that lets the buyer download a digital copy of the same comic via Marvel Comics app for iOS or Android. “What do I do with two of the same comic book?” you might ask. Well, you can put the hardcopy in a sealed plastic case and wait for it to become vintage and reward you with boat loads of money. And you can have your digital copy to read. Cool right? Marvel tested their idea last and garnered plenty of “positive reactions from both retailers and fans.” Of course. It’s a two-for-one deal. Why would anyone get upset?